Classification F.C.I. N. 198: Group 6 - Scenthounds and Related Breeds; Section 1 Scenthounds; Subsection 2 Medium Sized Hounds. Its origin is the same as for the short-haired: it dates back a long time ago, probably at the time of Phoenix traders from ancient Egypt. This dog is present, in fact, in several Egyptians drawings at the time of the Pharaohs. Since its introduction in our peninsula it became very popular and still is today. Largely applied breed, mainly in hunting on any sort of territory, it is a specialist in wild boar and hare hunt. 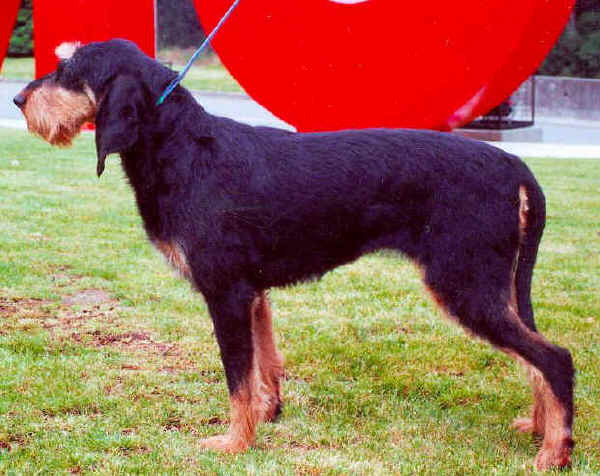 Almost similar in the temperament to the short-haired segugio (hound), it is a very extrovert dog, lively and playful. It has a good ability in the run, very resistant and fast, what make it one of the best hunting dog in the world. It is gifted with an exceptional smell, in fact it finds traces of the game during hunting very easily. It has very sweet eyes, a pleasant ringing voice. He loves helping his master in the hunt and likes walking, running and exploring around in the woods, never getting apart his master. It is very affectionate and obedient breed: these are the most relevant characteristics which probably have made this dog so popular nowadays. It is the most diffused breed together with the short-haired segugio. Seen from above the skull presents itself in elongated ellipsis shape; in profile, its upper longitudinal axis is moderately divergent in relation to the longitudinal axis of the muzzle; the profile of the skull is slightly convex; the bi-zygomatic width must be inferior to half the length of the head; the superciliary arches only slightly developed; frontal furrow not pronounced; the occipital protuberance should be distinct, but slightly recessed, therefore only slightly visible, perceptible only by touch: it must be short. Stop: vVery slightly marked; from the muzzle, the upper profile must ascend in a soft slope towards the skull. Nose: large; seen in profile protudes beyond the forward vertical line of the lips; fresh and moist, with well opened and mobile nostrils. Always black. Muzzle: the muzzle measures half the length of the head; its depth exceeds just slightly half its length; its width reaches the 17% of the length of the head; the upper profile is slightly convex; the lateral sides of the muzzle converge, but not to the point of making the muzzle pointed. In their entire length, the branches of the lower jaw are almost in a straight line; they are slightly developed in their fore part. The sub-orbital region is chiselled, but a little less than in the short-haired Segugio. Jaws: strong in appearance, normally developed; the dental arches of the incisors perfectly adapted. Teeth: white, regulary aligned and of normal size; complete; scissor bite is correct, pincer bite is acceptable. Eyes: large, luminous eyes of dark ochre colour; in semi-lateral position, the inner corner of the eyelids must be at equal distance from the forward edge of the nose and the external point of the occipital crest; fascinating expression, a look soft and proud with a veil of sadness; eye opening almond shape, with perfectly close fitting eyelids. The rim of the eyelids must be black. Ears: their inset, of moderate width, is at the level of the zygomatic arches; they are hanging, of triangular shape, flat in almost their entire length (66 - 70% of the length of the head) and very broad. The ear ends in a sharp point. Although thin, the ear cartilage must be rather rigid in its entirety; its insertion, very rigid, is characterized by a torsion which draws the ear forward without allowing it to relax nor to fold over on itself, nor to curl. The point is turned slightly inwards. The ear is covered with hair of moderate length, shorter than that of the body, less harsh, and without any fringing. Neck must connect with the body by blending harmoniously with the shoulders; very lean and light, it must give the impression of not being very muscular. Its length measured from the point of the shoulder to the point of the buttock, is equal to the height at the withers. Top line: seen in profile, from the withers to the rump, the topline is straight. Just slightly convex at loin level. Withers: only slightly raised over the backline and narrow because of closeness of the points of the shoulder blades, blends harmoniously with the neck. Back: upper profile of back is straight, well muscled, even if not very apparent. The ratio between the thoracic length and that of the lumbar region is of 3 to 1. The length of the loin is a little inferior to the fifth of the height at the withers; its width is a little inferior to its length; muscles well developed. Rump: upper profile of the rump is slightly convex. The rump is considered to be horizontal, because its obliqueness from the haunch to the tail set is between 15 to 20 degrees; its length is about 1/3 of the height at the withers, and its width the 2/3 of its length; powerful musculature. Chest - Its length reaches about half the height at the withers; its width is about 1/3 of the height at the withers; its depth must be about 48% of the height at the withers; the lateral sides show a slight convexity. The upper rib arches, however, must be well sprung. Chest of moderate width; the manubrium of the sternum must be at the level of the points of the shoulders. Underline: the lower profile is determined by a straight line which rises gradually towards a lean abdomen (belly), never tucked up. The flanks are slender, never fleshy. Tail: set high, on the line of the rump, thicker at its base than that of the short-haired Segugio, is covered with hair in its entire length, but without any fringing. At rest, it hangs sabre fashion. In action, it rises at the level of the topline and wags from left to right, while just touching the flanks lightly, or sometimes goes round in rotating movements. 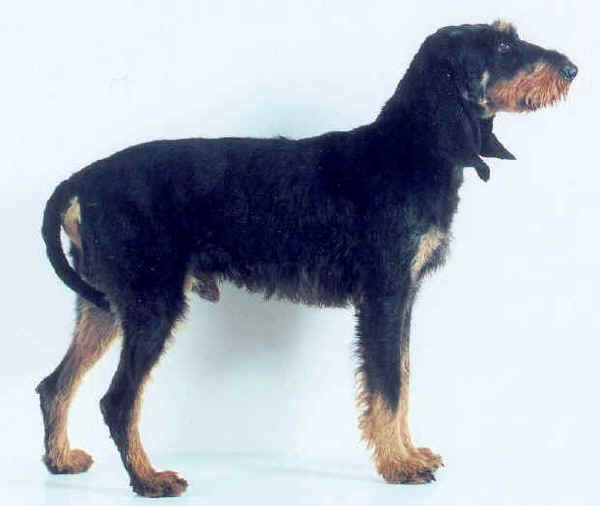 The tail is considered to be long although its tip end just close to the point of the hock. On the whole, the forequarters seen in profile, follow a vertical line which, from the scapular-humeral articulation, must reach the ground while touching the point of the toes, whereas a lowered vertical from the elbow point must divide in two almost equal parts, (the large being the front), the forearm and the carpus coming out at mid length on the back of the pastern. The height of the frontleg from the ground to the elbow is equal to half the height at the withers. Shoulder: the shoulder is lean, long, very free in its movement; the point of the shoulder blades are very close to each other. The obliqueness below the horizontal goes from 45ƒ to 55ƒ. Upper arm: well joined to the body; like the shoulder, endowed with long and lean muscles; set parallel to the median plane of the body. The scapulo-humeral angle is of 110ƒ, with an obliqueness of the shoulder blade of 45ƒ. Elbows: equidistant from the median plane of the body; they must neither turn in or out. Humeral-radial angle of 135ƒ to 145ƒ. Forearm: its length reaches 1/3 of the height at the withers; the forearm is vertical, the almost cubito-carpal groove is well visible. It must give the impression of a lean (dry) and very thin limb. Carpal joint: lean (dry), covered with a fine and thin skin. Seen from the front, it extends the vertical line of the forearm. Pastern: its length is at least 1/6 of the length of the foreleg measured from the ground to the elbow; in profile somewhat slanting towards the front. Forefoot: oval shaped (hare foot), well closed arched toes, covered with dense hair; digital pads not very fleshy, pads dry, hard, leathery, always black. Strong nails, curved and always black. The presence of some white nails (not pink) is not a fault. On the whole, a lowered vertical of the point of the buttock touches or almost falls on the tips of the toes. Seen from behind, a lowered vertical of the point of the buttock divides in two equal parts the point of the hock-joint, the hock and the hindfoot. The total length of the hindlimb is about 90% of the height at the withers. Upper thigh: it is long and wide. Its length reaches at least a third of the height at the withers. Its lower edge is slightly convex; the point of the buttock is very visible. The bulging muscles are clearly divided one from the other. The upper-thigh is slightly oblique from top to bottom and from back to front. The angle of the coxal-femural articulation varies between 90ƒ and 95ƒ. Stifle: in a perfect vertical line with the limb; neither turned in or out. The stifle joint angle varies between 110ƒ and 120ƒ. Thigh: its length is just slightly inferior to that of the upper-thigh, and its obliqueness below the horizontal is of 40ƒ. Covered with lean muscles; the groove between the Achilles tendon and the bone is well defined and evident, with the outer saphenous vein quite prominent. Hoch joint: seen laterally, its sides are very wide; it is considered to be low because the distance from the ground to the hock point must not exceed 27% of the height at the withers. The tibial-tarsal angle, closed because of the accentuated obliqueness of the tibia, oscillates between 115ƒ and 125ƒ. Hock: its length is defined by the height of the hock-joint: strong and lean, perpendicular to the ground. No dewclaws. Hindfoot: less oval than the forefoot, has all the same characteristics. Type of hair: on the body the length of the hair should not be more than 5 cm. The hair is definitely rough, except on the head, on the ears, the legs, the tail and the muzzle, where the hair is usually less rough than on the body and the lips; under the lips, the hair, although of moderate length, forms the socalled beard. The hair on the superciliary arches is of limited length so as not to fall over the eyes or hide them. The permissible colours are the whole range of solid fawn, shading from the dark red fawn with black overlay to light fawn, and black and tan. The fawn may have white on the muzzle and the skull (symmetrical mask or not), a white star on the chest, white on the neck, on the pastern and hocks, on the feet and the tip of the tail. However white is not desirable, and the less there is, the better. The black and tan may have only the white star on the chest; in that case, the Segugio is called tricolour. Faults: any departure from the foregoing points constitutes a fault which when judging must be penalised according to its seriousness and extension. These conditions apply also to dogs who pace constantly.